Tsarevich heads off in search of Kashchey, in order to free his dear mother. At one time Kashchey decided to get married. He began tormenting the magic mirror, asking it to show him the most beautiful woman in the world. And the mirror up and showed him the Tsaritsa, more beautiful than any woman Rus had ever seen. 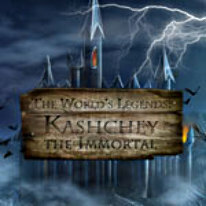 Kashchey swooped down in a black whirlwind and carried the Tsaritsa away God knows where, and locked her up in the Kingdom Beyond the Ends of the Earth in the very highest tower. The eldest son headed off in search of his dear mother, but perished. No news had been heard from the middle son in ages. Now it was time for the youngest son to equip himself for the trip. With his dear father's blessing, the Tsarevich prepares for his mission. And if he has enough of the spirit of a warrior in him, so that he does not fear his path, then he will be able to find his dear mother and conquer the evil-doer.